So me, not knowing better, says something along the lines of, “I’ve got a map hanging on the wall too”, so he comes back, and says he wants to see more maps, and it’s my turn or something along those lines. Not the one I’ve got on the wall, but one I pinched from Wiki, which is in the public domain. this one is from 1154 and is entitled Tabula Rogeriana. The one I have on the wall, I purchased (not a cheapskate, pinching a map from a caff) at Greenwich on the 21st October 2005, which to my mind was a very important day. Not so important to the Poms mind you, they decided they’d decided to celebrate the Great Day in JUNE, would you believe, something to do with the weather; typical. Anyway here it is; the War office had an old,rustic looking, frame that kind of goes nicely with the map, and she said I could have it. I like maps, too. Maybe I need to pinch some public ones as well. Absolutely he was. And what a beard he had. I used the term “pinching” more in a colourful sense than an accurate description. I am mindful of the creative rights of all artists. Oh yes, well, I do read and comment on some others besides yours. Didn’t mean to whinge. Been a long day, I suppose. But you’re right. One does need to reach out in some way. Yes, I love all animals, but I just melt into cats. I blend with them. And you love sweet Coco. Definitely Cocker Spaniel…does he have another “ethnic” blend as well? Coco is half American Golden Cocker half King Charles Cavalier. The American Cocker has a a softer face than the English, they don’t have a long snout, and are slightly smaller in build. They still like to hunt though. Right. Iv had the privilege of living with both a wonderful English Springer Spaniel and an English Cocker. Coco looks thoroughly huggable. I’m snuggling with two cats right now. Coco is an interesting mix. Very handsome fellow. I believe it. Freckles was very intelligent and quite sensitive. I was a child when he passed prematurely, and that still hurts. But more, I remember him with love. It is all still vivid. His fur was liver and white. Holly, the Cocker, was beautifully golden, rather like your Coco, though a bit lighter. I’ve always been crazy about maps. Can’t explain why, exactly. Looking at them is sort of like taking a journey to that time and place. Am particularly fond of topo maps of our mountains. Almost like looking at a photograph of the area. Seems like our Victorian chum/mate/pal/buddy has started something. A big yes to maps! The older, the better. One of the treasured items in my parents’ house was a real globe with the whole world on it. I never tired of turning it and looking at all the places there are to visit in the world–and imagining what it would be like to live here or there. In the Australian Maritime Museum at Darling Harbour in Sydney there is a very small, and might I add, treasured globe, which dates from 1602, if memory serves me correctly. For some reason it’s behind a locked probably bullet proof (they get lots of Yanks at the museum) glass cabinet; which also keeps out marauding, scavenging men from Victoria, who like to swipe things that don’t belong to them. By the bye, you STILL haven’t visited Coco’s birthday post 😥 He is aware of these things! here’s another for the map collection. I have always fancied myself as a competent cartographer. 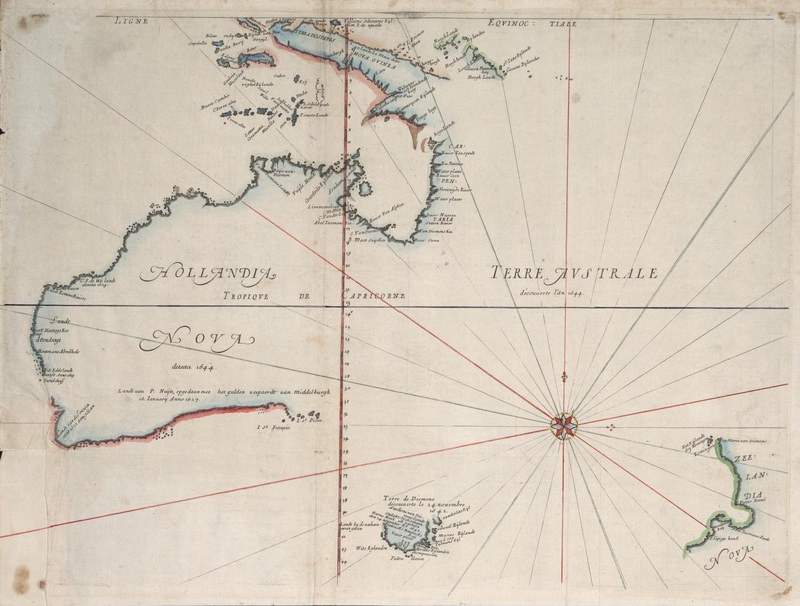 New Holland (Australia) -Thévenot after Blaeu, 1659, from Tasman, 1642-4. I haven’t noticed this hanging on any of the walls YOUR home Neill? It’s John i Melbourne who goes around pinching this stuff not me! One of my favourite places is an old print shop with their very interesting array of old maps, situated on the top floor of the QVB Building. I love maps! Your maps are wonderful. Lord BofB! I love globes, too! I remember in school, I loved when the teacher had us make different kinds of maps. Oh, I still carry folded-up maps in my car to enjoy on road trips. But your maps are cooler than my maps. I use the GPS when I am going somewhere I’ve never been before. I even did a blog post on my GPS lady. I can’t tell what your map is a map of, but I can tell you used the flash in your camera. Got rid of a lot of maps when we moved. I probably won’t replace them. It’s a map of Greenwich in England; think Greenwich Mean Time. There is also a bug Naval College there and this is a map of Greenwich from the 19th century. Dear Brian, I am very impressed. You have done a marvelous job. And PS. I didn’t pinch the map. My niece done it. Who can we get next for a map? I think Dear Elouise. As long as it has no political connotations. Well she did mention hat she likes maps, just that she needs to get one up on the wall before D says no! Previous A very special day, for a very special dog. Coco.